The Butterfly Bush just outside my window: how many words and images have been devoted to it over the years since this blog started in June 2002? It is a microcosm-aggregator of summer life, and when its blooms fade, life changes chapters, rhythms, and focus. So this year’s effort at a portrait of a clearwing moth (and a couple more pix I’ve yet to show here) are symbols for changing times on Goose Creek. It has been an unusual season–so much so that I might have to take back all those nasty things I’ve said about summer. This one I did not loathe. I never put away my flannel shirts and am wearing my Va Tech sweatshirt this morning as usual all summer long. We slept with the oscillating fan a total of one night this summer. The globe spent all its warming energies somewhere else this year and spared our always-cooler than average valley. It is not just our garden that has been free of some of the normal summer vermin: Japanese beetles, Colorado potato beetles, and the like. I don’t have any idea if that is a good thing or a bad omen of systems collapsing for things other than honeybees. The buckwheat I planted to attract pollinators was a miserable failure: two honeybees was the grand total observed simultaneously. Many of the tomato flowers did not get pollinated and simply withered producing no fruit. And the tomato vines are dying already with lots of unripened green fruits, nights too cool to bring them from green to red. We sorely need rain. The neighbors “up top” on the hardtop are without water. Just having a house full of company for a few days, what with extra showers, flushings and dishes to wash, has depleted their well reserves. A friend of Ann’s a little further down the road also now has a dry well. We’re 400 feet lower elevation than those houses, so hopefully have more aquifer charging our well down here. But it’s about time for the gentle edge of a tropical storm to swirl her wet gossamer gowns across our parched pasture and brown garden. On another note: Yesterday, I took a significant step towards getting prints of my photographs “out there”–beyond a mere web existence which has been the case since my digital shooting began in 2000. I’m having three (chosen from the dozen I’ve printed on the Epson 2880 in the month I’ve had it) to be framed. And not just any frames: let’s just say these will be special. And you can see them at the Jacksonville Gallery showing coming up this fall. Why are my eyes so blurry? Oh yeah: it probably has to do with the fact that we’ve been awake since 1:30 when the Murine (mouse) Olympics began upstairs. As Ann noted just now, it seems to happen every year about this time. Like I say, there is change in the air. And there will be DeCon for our visitors–not running wind sprints on the carpet in the upstairs room but in the space between our bedroom ceiling and the upstairs floor. (How do they run so fast in the pitch black dark, and where do they get those cleats they wear on their boots to make so much friggin’ noise?) Years ago, I drilled a hole in a flooring board inside the uncarpeted closet, into which later this morning I will funnel some tasty green pellets for our guests. Bon appetite! Fred..can you tell me about the critter in the picture with the butterfly bush? Several years ago I was working in my garden when one of those guys visited….I thought it was a hummingbird….a baby hummingbird? a giant bee? I’d never seen one before but since then have seen them often. I’ve talked to people about them….but really haven’t gotten a definite answer to what they are. Can you enlighten me…? My best guess is baby hummer. oh…is it a clear wing moth? I missed that. Wow…maybe that’s not the same guy i’m talking about….though it sure looks like it. It’s hard to tell in the photo how big it is. 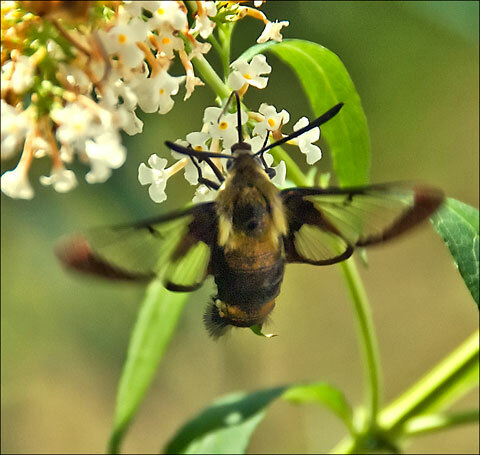 Rio…I’m sure what you’re seeing is a Snowberry Clearwing, sometimes called the Bumblebee moth. I have a photo that gives you a better scale on my blog, http://www.wythenotes.com under the post flora and fauna. (in the ancient Roman calendar) a day falling roughly in the middle of each month (the 15th day of March, May, July, and October, and the 13th of other months), from which other dates were calculated. Compare with nones , calends . ORIGIN late Old English : from Old French, from Latin idus (plural), of unknown origin. I agree, it’s been a pretty good summer, with a minimum of those super hot muggy days and nights requiring a fan. We really like being able to live without air conditioning, and this year has been a bonus in that regard. I’ve noticed a similar dearth of bugs in the garden, with almost no squash bugs, for example, which is a boon for us organic types. And the deerflies have seemed minimally irksome this year. The drought drags on, and like you, we’re hoping for something tropical as a drought-buster. In the meantime, I’m watering the garden from the creek .